MudSoup is that crazy creative time of pulling all the parts together to make something new and beautiful. It’s the moment of quiet struggle within while energies swirl. The artist, the collective whole of humankind, and the life of the spirit are thrust forward and upward. Adventuring far and wide across the planet, I have lived off my wits and creative talent in the Rockies, the Yukon, the Yucatan, and several schools, including L’Ecole des Beaux Arts in Grenoble, France. I hitchhiked across our continent several times and paddled down the Yukon River. 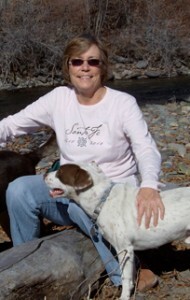 I apprenticed with Susan Anderton in Crested Butte, Colorado, learning silkscreen printing and drawing. Then living off the land at Sunrise Communal Farm in Evart, Michigan, a group of us made candles and leather goods, and sold them at several crafts stores around Michigan. In my little studio back in Crawford, Colorado, I cranked out signs, business cards, t-shirts, and pen and ink drawings. And then married and lived in Little Rock, Arkansas long enough to renovate a 19th century cottage, earn a couple of degrees in art and writing, and raise an amazing kid. Somewhere along my path, I became a mudslinging pyromaniac. Actually, my intense involvement with clay began in undergraduate classes in 1980, working with high fire thrown ware, then my work evolved into hand building sculptural forms. Aside from traditional reduction firing, I’ve played with both soda and wood firing. Working with Micaceous clay connects me with the energy and cycles of Clay Mother and the fire of the spirit. The Fireclouds are her magical kiss. In my spiritual growth, I believe that goodness, grace and light prevail. I trust the process of life. Every experience and path taken so far has led to this very moment. And that’s the gift, this very moment. Breathing, being and creating.